free long term NHS care ( Continuing Care ) under UK Law and the Coughlan case. Pamela Coughlan won her case against the Government in the Appeal Court in July 1999 . Governments change, but the Law has not. "Social Care" is part of Health Care - according to the Law Society and the Royal College of Nursing. The NHS must pay all Care Home costs. See What the Media report and Parliament e.g. TV broadcasts and newspaper articles. Read our Press Release, unchanged since 2012 and still true. See Robin's hard-hitting Rotary Club briefing slides from 2009, still valid, in PDF printable form or as a PowerPoint Briefing - found in 2018. The NHS budget should have increased with increased population, inflation, and life expectancy. See the Overview for "the big picture". These pages advise the UK public on their right, under existing law and the Coughlan case, to free nursing care 100% funded by the NHS - known as "Continuing Care". The Law demands that the NHS pay all Care Home costs. 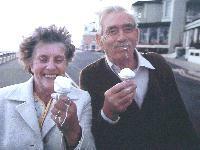 The site is dedicated to Len and Eve Lovelock and was set up by their son Robin, after both good and bad "NHS/Social Security experiences" with his parents, seen here. 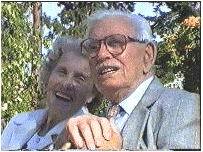 Len passed away at home in January 2002, and Eve at Holyport Lodge Nursing Home in February 2003. Robin and his sister Sally thank all those who provided professional and loving care in the last years of Len and Eve's full and happy lives, particularly staff in Holyport Lodge Care Home. If the patient's health care need is equal to, or greater than that of Pamela Coughlan, then under the law, they qualify for Continuing Care. Watch the video of Pamela Coughlan, then ask yourself if the patient needs less care than Pam. print the NHSCare.info flyer and educate all involved, including Family, Care Home, NHS and Social Services staff. discuss with friends and relatives and confirm that you have a strong case under existing Law and "Coughlan". find a friend or relative to act as your representative, able to write and respond to letters over what may take years. document the patient's care needs and compare these with those of Pamela Coughlan after visiting advice to solicitors . consider refusal to discharge from hospital, or to pay for care. If so, think it through and do what is best for the patient. make sure you have written at least one letter, mentioning Coughlan, such as this draft letter. keep a paper file of all information: printouts from www.nhscare.info, letters, medical history, and notes of meetings - with names. take care what you sign when dealing with NHS and Social Services. Your signature might indicate agreement. If you feel you must sign, in the interests of the patient, then add a comment beside your signature such as "Without prejudice. All Rights Reserved: see www.nhscare.info". record in writing any disagreement with NHS/Social Services: by them and by yourself soon after the meeting. They might later claim, "if it's not written down, it didn't happen". consider a complaint to the Ombudsman, or Healthcare Commission, or Care Quality Commission - which one applies can change. visit the message board and share your experiences with others; you are not alone. consider use of a Law firm and "no win no fee" for Judicial Review - but see our advice to solicitors . "The judgment in Coughlan clearly establishes that where a person's primary need is for health care, and that is why they are placed in nursing home accommodation, the NHS is responsible for the full cost of the package. " - from the summary of the Law Society's Evidence to the House of Commons Health Committee Inquiry into NHS Continuing Care. You may find the video of Nicola Mackintosh, Pam Coughlan's solicitor, informative. This interview was first broadcast on BBCTV's Panorama in 2006, but Nicola's words are as true today as they were then. Please see our advice for solicitors page. Make sure you are not breaking the law. Ignorance of the law, and the fact that many others share this ignorance, is no defence in a Law Court. The Department of Health's National Framework, which led to the NHS Decision Support Tool (DST), used for assessment of NHS Continuing Care, is "...not fully compliant with the Coughlan judgement...” - the Law Society in September 2006. . "Social Care" is part of Nursing Care. Click here for information from the RCN and the amnesty for "whistle blowers". If you are a patient or their family, please read and understand the "simple advice for families" above, before contacting us. You will find email addresses and 'phone numbers on our contact page. What little help Robin gives to individual families is mentioned on the contact page. After emailing Robin one line answers to simple questions, like your full name and address, he will send you an email with information that is not public on this site. There is then the opportunity for a 'phone call, to discuss the strengths and weaknesses of particular law firms, and what to expect in your battle to obtain NHS Continuing Care, through the NHS Appeal process - and, if required, the Courts. We would all like to thank Pamela Coughlan, who at great effort and expense, paved the way over many years in fighting her case, leading eventually to the Appeal Court decision in 1999 now known simply as "Coughlan". Robin first spoke to Pam in 2003, and Pam is happy for us to repeat her words first quoted after Ann Abrahams' report was released in February: "I am delighted with the Ombudsmans' decisions. This reconfirms that the NHS has cheated people out of the free care they deserve. Elderly people and their relatives face an assault course if they want to complain. They have to go through endless complaints procedures, tribunals and complaints convenors to get to the Ombudsman. It's shameful that the Government guidance put the burdon on these helpless people." Derek's Page has much of the early information on NHSCare.info, which originated from Derek Cole. Derek once described himself as an "... old retired Headmaster and only an academic lawyer". Robin is extremely grateful to Derek, who provided invaluable legal advice, and assistance in writing the many letters required for Robin's mother's case. Derek and Robin would like to thank those, such as Steve Squires and David Gooch, who successfully won their own cases, and have shared information to help others. There is no way that any one of us could cope with the deluge of work related to many tens of thousands of families who might discover that they have a claim to make: however, we hope these pages will be of practical help in both "understanding and doing". Show our Press Release and the NHSCare.info flyer to your editor: Read the overview, so you see "the big picture". Please try and understand, and then print or broadcast, the simple and important facts of any story, with some ADVICE. e.g. the Law demands that the NHS pay ALL care home costs, if the patient needs as much care as Pam Coughlan . Little has changed, but the facts are now even clearer. We ask that the NHS, Social Services and the Government obey the law. This is NOT "thousands of people and millions of pounds" - it's "hundreds of thousands of families and tens of billions of pounds". See What the Media Report and Parliament for the £250,000 win of care home fees in 2010 by the family of a war veteran, aided by a law firm who have already won back over £9 million from the NHS for their many clients; Stephen Johnson's win of £50,000. Play back recent broadcasts such as Steve Squires on BBC Radio Solent or others within our campaign group on TV. Panorama broadcast their "National Homes Swindle" programmes in 2006. See what Ian had to say to Panorama here. Our group were the primary source for Panorama and numerous other broadcasts and newspaper articles, such as the Daily Mail's "How YOU can win back money on unfair care costs". Ian Perkin won his case: see the message from Ian. "This is a case where people have been swindled out of their savings, hounded out of their homes and conned out of the free care they deserve." - Bleddyn Hancock, former General Secretary of NACODS in Wales. The NACODS press release is here. See Bleddyn on TV here , and in "the politics show" on Stephen Johnson's site . Derek Cole and Ian Perkin appeared in the Channel 4 TV News in April 2005, triggered by release of the Commons Select Commmittee report. You may read Derek's summary of his evidence given to the committee here and his full report is here. Derek's expert legal advice given to MPs in November 2004 is here. "It is unlawful to ask the patient to pay and we will not pay" - from Derek Cole's address to a pensioners group here. Read Ian Perkin's letter in the September 2006 Public Finance Magazine here under "A challenge to NHS legality"
Read the article, written by 90 year old Tony Adams here. Tony highlights the injustice - but with a wry sense of humour. The Department of Health's National Framework, which led to the NHS Decision Support Tool (DST), used for assessment of NHS Continuing Care, is "...not fully compliant with the Coughlan judgement...” - the Law Society in September 2006. Financial pressure concentrates the mind of Government. Maybe it's time for health insurance policies to cover long term health care ? Insurance companies could team with law firms to claim back £billions from the NHS. Consult your legal advisors and see the footnote on the overview. Maybe we will add more detailed advice pages here, such as that for solicitors , targeted at those working within organisations who will be affected by the UK public discovering this site and the truth about how the law stands. We hope to ensure their legal advisors are properly briefed, and that this results in policy changes. e.g. corrections to literature from some major charities, which confuse rather than inform; Unions following NACODS lead and helping their retired members assert their right to Continuing Care; Large businesses who previously did not want to "rock the boat" becoming aware of the law and adjusting their policies, including sales literature. Insurance, Financial Services and Care Home businesses to make plans, to limit damage to their business and to exploit the opportunities. Remember: "every crisis is an opportunity" . The above link to PAM.WMV is 5MB. A DVD-quality version is available from Robin for solicitors and journalists. Who else can help me ? See above for "contacting us and getting help from Robin ..."
Visit Steve's message board and MissLawBore's Forum; share your experiences with others; you are not alone. Steve Squires, on the right, offers help - see The Steve Squires Page. The "reserve" NHSCare message board has been moved to NHSCare.multiply.com . You may find this Frequently Asked Questions page usefull - kindly supplied by NACODS. Tried www.google.com ? e.g. to document it is a HEALTH condition. e.g. "what is alzheimers", "MS", "MND", etc. You can read Ian Perkin's legal submission which resulted in Continuing Care for his mother on our advice for solicitors page. Derek's Page provides detailed information and advice from Derek Cole, our expert legal advisor. David Gooch (on the right) passed away on 13th October 2011 : you may wish to read David's Story. Thank you David - from all of us. from Robin: For many years I've mentioned the "core group on NHSCare.info", or "our band of brothers - and sisters". The term "band of brothers" originates from Shakespeare’s Henry V and " "We few, we happy few, we band of brothers". The sister is, of course, Pamela Coughlan. The others include Derek Cole, David Gooch, Stephen Squires, Ian Perkin, Bleddyn Hancock and myself. i.e. those most active in providing free information on www.nhscare.info and in furthering our cause to make the NHS and Government obey the law. I would like to thank these fellow-campaigners, and the many more who are fighting their own cases, or simply helping us "spread the word": Thankyou. 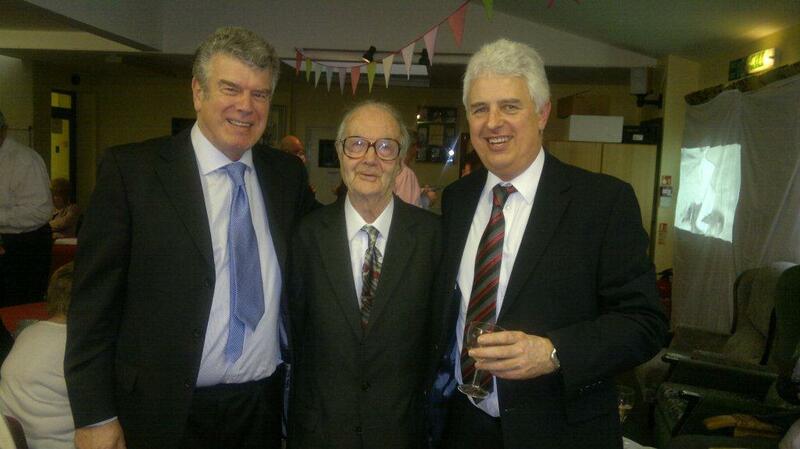 The picture below was taken at Derek's 80th Birthday Party in March 2011. From left to right, that's Robin Lovelock, Derek Cole, and Ian Perkin. We have been on this www.NHScare.info web site since 2003. You may not know how recently Derek provided input: it was April of 2015. See Robin's pre-Election message ! Ian Perkin was the finance director of St George's NHS Trust in London for 12 year until 2002. In 2001, he blew the whistle when he discovered that the Trust had altered figures on the number of cancelled operations. He is now a treasurer of a Police Authority. See what Ian had to say to Panorama here. "With those close to me affected, I feel strongly about the issues surrounding mental health. So I found your account of your stay in Bluebell Ward and your 'inside story' of the NHS mental health system in general, absolutely fascinating and extremely insightful. I really appreciate you taking the time to get in touch and I have enclosed a booklet in which I wrote a chapter about mental health when I was first elected in 2005, which you may find interesting. As your MP ...." etc. Note from Robin: Adam's is Chapter 1 of the book: "the forgotten ... new thinking on society's most vulnerable people, from the Class of 2005 Conservative MPs". Published in Oct 2006 by The Class of 2005. ISBN 0-951909-5-9 Chapter 1, "The Great Depression" is ~23 pages starts with a excellent overview of mental health within society, then concentrates on "Depression", concluding with specific recommendations, the first of which was: 1) Tackle Stigma - ending with "... my key recommendation is that national figures should speak freely about depression and mental health disorders". Maybe Adam was 10 years ahead of his time ? Famous personalities (I'm certainly not one) have signed a petition, and "come out" on their personal interest in Mental Health issues.